Availability of uniquely designed insurance policy comes as the popularity of escape rooms continues to grow throughout North America. 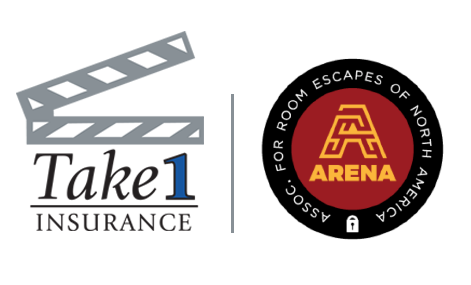 DALLAS, TEXAS, October 15, 2018 — Asserting that a growing population of North American escape room owner/operators needs a customized, cost-effective insurance policy uniquely tailored to their market needs, the Association for Room Escapes of North America (ARENA) today introduced the industry’s lowest cost insurance program designed by Take1 Insurance, the entertainment and live event industry’s leading insurance solutions provider. The new ARENA program offered through Take1 Insurance provides members throughout the country with competitively priced General Liability and Property insurance in a “package” that includes Business Interruption and Hired/Non-owned Auto Liability as well as Excess and Liquor Liability, if needed. “Virtually all escape room companies are considered small business by insurance carriers,” Davis explained. “As such, there are not enough premium dollars to justify a busy underwriter taking the time to really review inherent risks (or, lack thereof). Further, escape rooms in the U.S. are—by insurance standards—too new to establish actuarial loss expectations. Adding those two factors together equals the typical cavalcade of restrictions and exclusions that underwriters use to protect themselves from losses. ARENA members can find out just how little an ARENA-endorsed insurance solution can cost by taking four minutes to complete a short application here. U.S. Risk‘s Take1 division has been servicing the insurance needs of the film and television production industry and has expanded significantly to meet the needs of audio-video and communications industry clients as well. The company’s experience includes underwriting film and television production companies, DICE (documentary, infomercial, commercial, educational) producers, touring entertainers, concert/playhouse venues, concert promoters, video game developers, and specialty rental operations focused on audio, visual, lighting, sound, grip, and production. For additional information, visit www.take1insurance.com. ARENA is the only bona-fide trade association (IRC 501(c)-6) dedicated to escape rooms in North America. Founded on our workers’ compensation, general liability and property insurance solutions, ARENA created the best-in-class online directory, developed a library of shared best practices for owners, published white papers to promote the industry, developed liability waivers customized for escape rooms and partnered with other associations to educate their members on how escape rooms enhance teamwork. In the future we will bring a major medical offering to our members, hold trade shows, refer legal help and partner with prop specialists. Join today to see how ARENA can help you! For more information, visit www.escapegamesamerica.org.